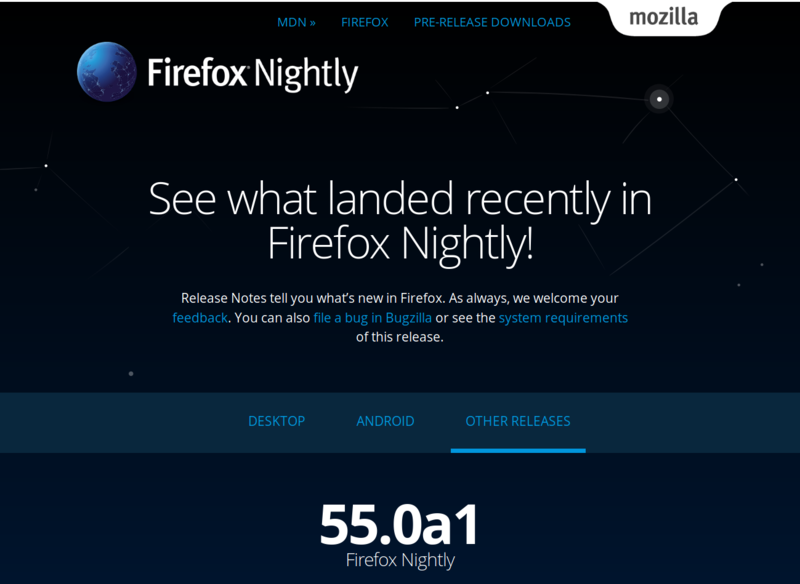 Every day, multiple changesets are merged or backed out on mozilla-central and every day we compile a new version of Firefox Nightly based on these changes so as to provide builds that our core community can use, test and report feedback on. This is why we historically don’t issue release notes for Nightly, it is hard to maintain release notes for software that gets a new release every day. However, knowing what happens, what’s new, what should be tested, has always been a recurring request from our community over the years. So as to help with this legitimate request, we set up a twitter account that regularly informs about significant new features, and we also have the great “These weeks in Firefox” posts by Mike Conley every two weeks. These new communication channels certainly did improve things for our community over the last year. But what does it mean to have release notes for a product released every day? It means that in the context of Project Dawn, we have started monitoring all the commits landing on mozilla-central so as to make sure changes that would merit a mention in Firefox final release notes are properly documented. This is something that we used to do with the Aurora channel, we are just doing it for Nightly instead and we do that several times a week. Having release notes for Nightly of course means that those are updated continuously and that we only document features that have not been merged yet to Beta. We also do not intend to document unstable features or features currently hidden behind a preference flag in about:config. The focus today is Firefox Desktop, but we will also produce release notes for Firefox Nightly for Android at a later stage, once we have polished the process for Desktop. A great idea and as long as this will not mean that _These weeks in Firefox_ are going away I also like the idea. As a security researcher, where can I find the information on “unstable features or features currently hidden behind a preference flag in about:config” that are in Nightly so that I can help secure the browser before release?